Electromyography is the technique for calculating and recording the action potential of muscles. EMG is taken using a device called electromyography and the record obtained is known as electromyogram. The electrical activity of muscle cells when they are active and at rest can be analysed using an EMG. The measured EMG potentials range from 50 µ Volt to 30 millivolts. Mainly there are two kinds of EMG measurements. 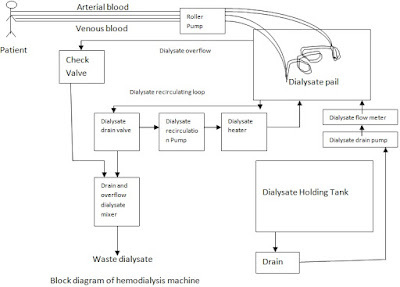 The first method is using surface electrodes and the second one is using needle electrodes. The Surface EMG electrodes are used to monitor the electrical activity of muscles generally whereas the needle electrodes are used to monitor the electrical activity of muscles generally whereas the needle electrodes are used to observe the electrical activity of only few fibers. A trained expert can observe the electrical activity of muscles when the needle is inserted. There is a normal electrical activity for the muscle fibers at rest. The physician or concerned expert examines the normal activity of muscles when the needle is inserted. There is a normal electrical activity for the muscle fibers at rest. The physician or concerned expert examines the normal activity of muscles. The abnormal spontaneous activity indicates that some nerve or muscle cells are damaged. 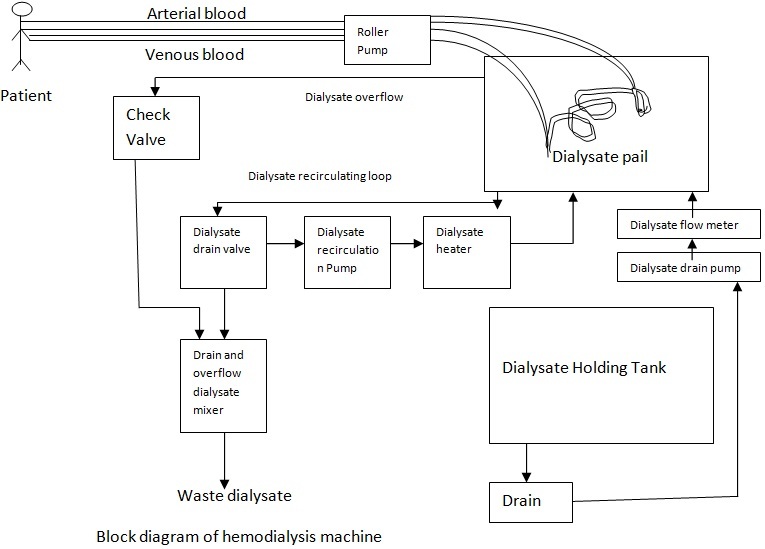 At a time potentials from different electrodes are taken. So the needle electrodes have to be placed at different locations to obtain an accurate EMG. So the intramuscular EMG is considered to be too invasive. So in order to obtain the general activity of the muscle cells we use surface electrodes which need to be placed only on the concerned area. So no insertion is required. This technique is commonly used in many applications such as in a physiotherapy clinic where the muscle activity is monitored by the surface EMG electrodes and the patients can have visual stimulus when they activating the muscles. So when the motor neuron or muscle fiber is stimulated, the action potential is transmitted across the muscle it is passed to the connected nerve fibers. Actually during EMG we are evaluating this bioelectric potential from different cells. 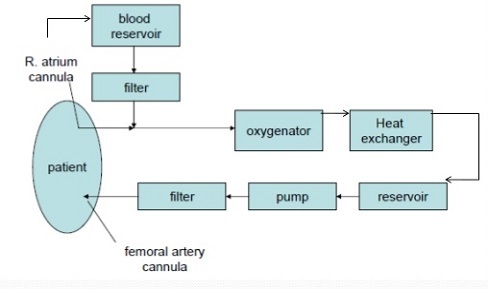 This potential is collectively called motor unit action potential (MUAP). EMG signals are made up of superimposed MUAPs. Hence the shape of the electromyogram is affected by factors such as number of muscle fibers under consideration, the metabolic type of muscle fibers etc. 1. EMG electrode: As told earlier, the electrode used for EMG recording can be of surface type or needle type depending on the area from which the EMG is to be obtained and the type of measurement. If we need to have EMGs from many individual muscle cells rather than from the surface as a group, needle electrodes are the best choice. But if the general activity of a muscle is to be analysed the surface electrodes can give the accurate values. 2. Bioelectric amplifier: As the name implies, the bioelectric amplifiers are used to amplify the bioelectric signals obtained from EMG electrodes. 3. AF amplifier: At rest under normal condition the sound does not undergo large variations. But abnormal and spontaneous activity may be distinguished by the sudden change in sound and this can be analyzed by the physician. The abnormal activity usually indicates muscle damage and they can easily find out the nerve or muscle damage. So physicians normally use AF amplifiers during EMG measurement so as to distinguish there sounds clearly. 4. Oscilloscope: The measured EMG can be connected to the oscilloscope to visualize the EMG. The abnormalities in the working of nerves and muscle cells can be identified by a physician by analyzing the EMG waveform. The EMG can also be stored using special oscilloscopes such as DSO (Digital Storage Oscilloscope) for future analysis. 5. EMG recorder: Unlike ECG, EMG cannot be recorded in a low speed chart paper recorders because of its extreme low frequencies. So it will be less useful. Normally we use the photographic recording of EMG. For this a light sensitive paper is moved over the recording CRT. 1. The normal EMG is in the range of 60 – 70 Hz. The EMG appear as a random noise signal the shape of the waveform may vary based on the part of the body from which EMG is taken. 2. Due to the low frequency limitation, EMG cannot be recorded on a strip chart recorder because it cannot give a clear idea of the waveform. 1. EMG can be used to diagnose two main categories of diseases. They are neuropathies and myopathies. In EMG representation, an increase in duration of action potential is an indication of neuropathic disease and a decrease in duration of action potential is an indication of myopathic disease. 2. EMG is utilized as a diagnostic instrument for detecting neuromuscular diseases. 3. EMG can be utilized for silent speech detection which identifying the speech by examining the EMG activity of muscles related with speech. So far, we have discussed only the sum-of-products expressions. We now discuss the reduction process in the POS form. It may be noted that, because of the dual nature of binary systems, any procedure or rule that is valid in the SOP form is equally valid in the POS form also. 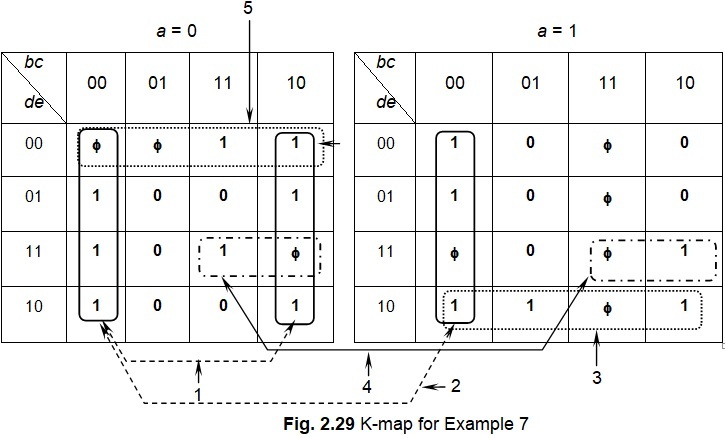 Just like SOP functions, POS functions can also be represented in a K-map and the elimination of variables can be done as in the case of SOP. However, the K-map designations of cells differ and the entries are 0s instead of 1s. 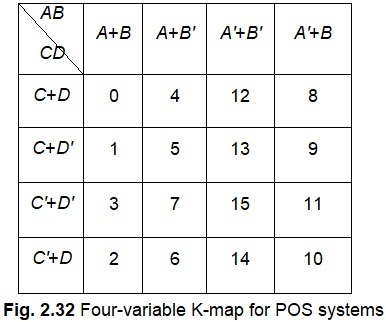 The four-variable K-map off a POS system is shown in Fig. 2.32. The cells are numbered from 0 to 15 as in the case of SOP form. However, the cell designations have been changed. In SOP form, the individual cells were designated as product functions like a′b′, a′b, etc. In the case of POS form, multiplication gets changed to summation For example, the Cell 0 is designated as A+B+C+D, Cell 1 is designated as A+B+C+D’, and so on. In this text, the cells are designated using capital letters to distinguish them from SOP form (not as a rule, but as a convenient arrangement). Further, for the same reason, we have replaced the number designation of 00, 01, etc. with A+B, A+B’, etc. on the top and sides of the map. Solution: The Greek uppercase letter Π represents a POS expression, just as S represents an SOP expression. The entries in the POS cells must be 0s. The cells in which there are no entries must be filled with 1s. Just as in the case of the SOP form, here also we can have don’t-care terms. Reduction process is similar in both the SOP and POS forms. Notice that the POS terms are called maxterms. 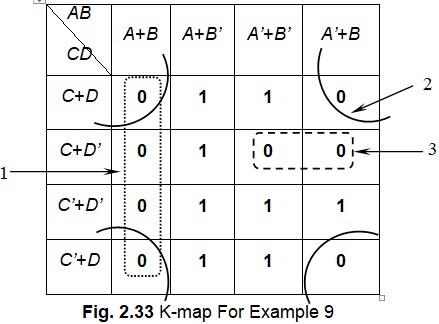 The K-map for Example 9 is shown in Fig. 2.33. Example 10: Let us now introduce don’t care terms in cells 4, 5, 11, 14, and 15 of Example 9. The new function is P = Π (0, 1, 2, 3, 8, 9, 10, 13) + d (4, 5, 11, 14, 15). Obtain its reduction. It can be seen alternate groups using don’t-care terms also exist in this case. Then the final expression will be different from that given in Eq. (2.34). 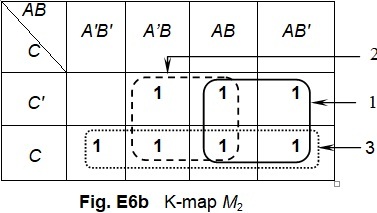 A six-variable K-map is shown in Fig. 2.30, which also shows cell designations. 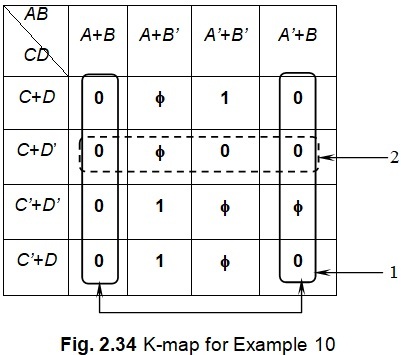 This consists of a group of 4 four-variable K-maps. It can be seen that the reduction process becomes highly complicated with six variables because locating similar positions in the individual maps is a very difficult task. Entries are made as per the designations of the cells shown in Fig. 2.30. It may be noted that the individual charts are designated as 00, 01, 11, and 10, respectively. The cell designations begin from 000000 (corresponding to decimal 0) to 111111 (corresponding to decimal 63) as shown. 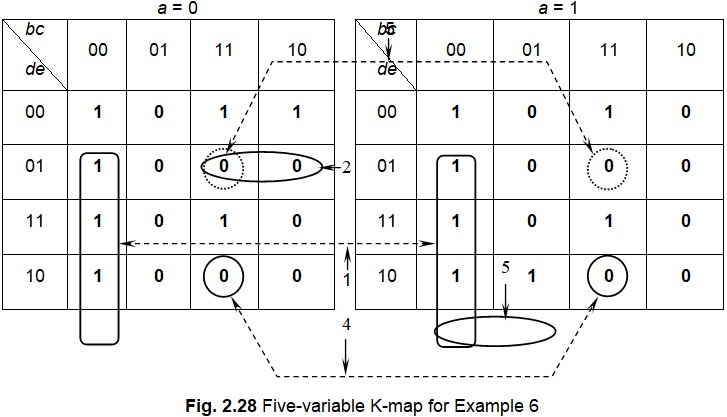 As in the case of the five-variable K-map, entries in similar cells can be combined to eliminate the involve variable (or variables) and thus simplify the given logic function. Example 8 will illustrate this. Example 8: Simplify S(12, 13, 14, 15, 28, 29, 30, 31, 44, 45, 46, 47, 48, 49, 50, 51, 60, 61, 62, 63). Solution: Figure 2.31 shows the entries for Example 8. 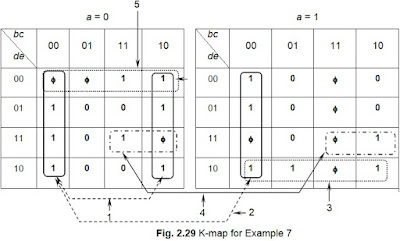 Figure 2.27 shows a five-variable K-map. The variables may be designated as a, b, c, d, and e, respectively. 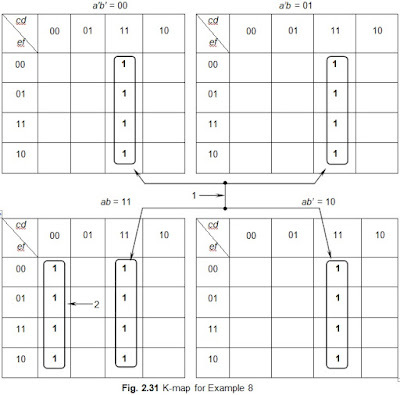 The five-variable K-map is in effect two four-variable K-maps drawn horizontally to form an extension of each other. 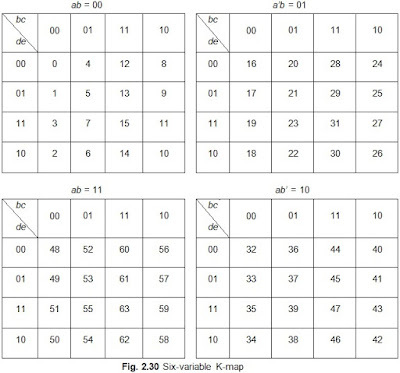 The two four-variable maps are designated as a = 0 and a = 1, respectively. Thus, the map a = 0 represents cells designated from 00000 (≡decimal 0) to 01111 (≡decimal 15) and the map a = 1 represents cells designated from 10000 (≡decimal 16) to 11111 (≡decimal 31). 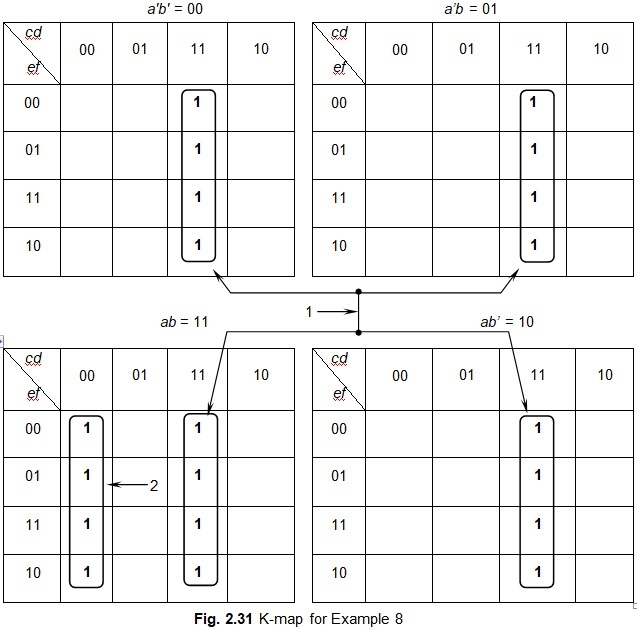 The simplification using the five-variable K-map is slightly complex and requires a lot of careful inspection of the two constituent maps. 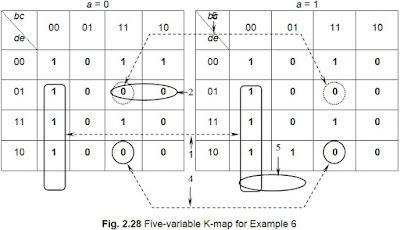 We shall now consider an example to illustrate the simplification process in a five-variable K-map. Solution: We know that adjacent-cell entries can be reduced by grouping them. In Fig. 2.27, we have two separate charts or maps. How do we go about to find the adjacencies? There is no real difficulty in this if we consider the fact that the two charts themselves are adjacent to one another with the main element a = 0 for the first map and a = 1 for the second map. For example, the entries in the zeroth cell and the sixteenth cells are adjacent to each other because the zeroth cell represents 00000 and the sixteenth cell 10000. The two cells differ in the variable ‘a’ only and this gets eliminated if we group the entries in cells 0 and 16 together. In fact, a gets eliminated whenever the entries in corresponding cells of both the charts can be grouped together. Based on this principle, the entries of the given example are grouped, as shown in Fig. 2.28. It may be noted that don’t-care terms can appear in five-variable maps also. The following example illustrates this. 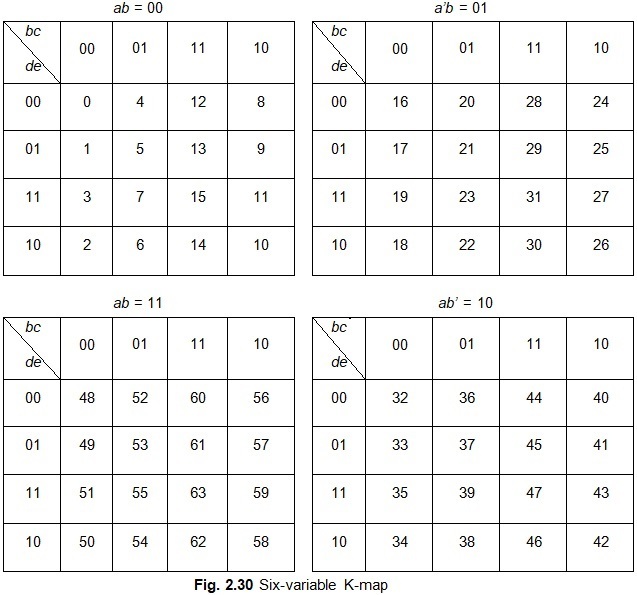 Solution: The K-maps for Example 7 is shown in Fig. 2.29. Example 1: Prove that AB + AB′ = A. Example 2: Prove that (A + B′) B = AB. In the above proof, we have used the relation= A(1+B) = A. Example 5: Prove that A⊕B⊕AB = A + B.
where we have used a relation similar to B + B′C = B + C.
Hint: As stated earlier, logic simplification through algebraic methods is very tedious and requires the knowledge of many fundamental theorems and laws, especially when the RHS part is not given. To keep these theorems in memory is not that easy since there exist several of them. A + A′ B + A′ B′C + A′ B′C′D + … = ? In the above problem, since the RHS is not given, we are not sure what the answer (RHS) would be. To find the answer (i.e., RHS), we first draw the three-variable map M1 as shown in Fig. E6a and enter the implicants A, A’B, and A’B′C in it as shown. Next we draw K-map M2 as shown in Fig. E5b and remove the first encirclements. Then we regroup them as shown in M2 to find what A + A′ B + A′ B′C would be. Now we are sure what the RHS would be in this case. Knowing the answer in advance, we can prepare our strategy accordingly to solve the problem. Extending the above two results, using mathematical induction, we get the desired results. Example 11: Prove that x′y′z +yz + xz = ? where we have applied the consensus theorem on the bracketed terms. Example 14: Prove that: A′C′ + ABD + AB′D′ + ABCD′ = ? Example 15: Prove the De Morgan’s laws, viz.,(A + B)′ = A′B′ and (AB)′ = A′ + B′. Proof: These laws were enunciated by Augustus De Morgan (to be pronounced as da morgan), a nineteenth century British mathematician. To prove these laws, we make use of truth tables: Table E14a is used to prove the first law. It can be observed that the entries in the rightmost two columns are the same; this proves the first law. Table E14b proves the second law. The entries related to the second law are as shown in the table. As in the first case, in this case also the entries in the rightmost two columns are the same, which proves the second law. Proof: Involution law becomes highly useful in solving problems applying De Morgan’s laws. The law can be proved using the truth table E16. We find that the first and last columns agree with each other, which proves the law. Example 18: Define the EXOR function. Solution: The logic function Z = AB′ + A′B is called the EXCLUSIVE-OR (EXOR or XOR) function. This relation can be derived from Table E17a, the truth table for the OR function. In Table E17a, if we change the last row as shown in Table E17b, we get the XOR function. where the symbol ‘⊕’ represents the XOR operation. It is to be noted that it is the XOR operation (and not the OR operation) that really represents the algebraic addition of two bits. Example 19: Define the EXNOR function. Solution: The logic statement (A′B+AB′)′ is called the EXCLUSIVE-NOR (EXNOR or XNOR) function. This relation is derived from the truth table for the OR function as shown below. EXNOR represents the complementary operation of the algebraic addition of two bits. The EXNOR operation in the last column may be read as “NOT of either A OR B”. Example 20: Use De Morgan’s laws to expand the XNOR relation. Example 21: Explain the principle of duality. We find that Eq. (2) is the complementary De Morgan’s law. This suggests that the De Morgan’s laws form a dual pair. A function F(x) is said to be the dual of another function f(x), provided that F(x) is obtained from f(x) by replacing the multiplication signs (∙) and summation signs (+) in f(x) with summation signs and multiplication signs, respectively, and with no change in the variables of f(x). The definition given above may also be considered as the duality theorem. In this context, we may define duality as the state of being dual. Example 23: Find (ABC′)+(ABC′)′ using a different method. Example 24: Find w(x + y′z) + x + y′z. Example 25: Find (w + x′ + yz)(w′ + x′ + yz). Example 26: Find (a + b′)(a + c + d)(a + c + d′). Example 27: Find ab′(c + d) + (c + d)′. It can be seen that the reduction process is quite laborious and lengthy. Further, the reduction has been performed based on hunches and previous experience. Experiences and difficulties of this kind led to the development of the K-map and QM methods of Boolean reduction. Example 28: Find a + b + c′d(a + b)′. Example 29: Find [(ab)′ + a′ + ab]′.